A sea floor fissure from which a spring of geothermally heated mineral and gas rich seawater emerges. Hydrothermal vents are found on some oceanic ridges in zones of active seafloor spreading. First discovered in 1977, deep-sea hydrothermal vents are typically small-scale sites that emit geothermally heated water. Hydrothermal vents form as a result of volcanic activity below the ocean floor. Sea water, which permeates into the seafloor, is heated by this geothermal activity. The water, rich with dissolved metals and minerals, erupts out of the sea-floor from the vents which often look like chimneys with coloured ‘smoke’ erupting from them. ‘Black smokers’ are the hottest type of vent where the plumes of water can reach temperatures of 400°C 1. Fauna, which live around these vents, are based on chemosynthetic food chains where the species at the lower end of the food chain, typically bacteria, synthesise energy from the chemicals in the water. Chemosynthesis is the equivalent to photosynthesis, but organisms produce energy from chemicals (e.g. sulphur) instead of sunlight. Hydrothermal vents are globally distributed, but their location is determined by tectonic conditions. Where plates form, such as mid-oceanic ridges and in areas where there is volcanic activity, the Earth’s magma is close to the seafloor and can heat water which has seeped down. The hydrothermal vents are therefore associated with regions of high tectonic activity and intersections of continental plates 2. Hydrothermal vent areas can support very densely populated ecosystems, where faunal density and biomass are comparatively greater than the surrounding seafloor 1. In addition, hydrothermal vents also support highly unique fauna: this unique fauna includes chemosynthetic microbes (bacteria and archaea), that in turn supports evolutionary and ecologically unique communities of shrimps, crabs, tube worms, clams, and other species that exist in no other habitat on Earth 3. Within and around vents, researchers have discovered 500+ new animal species, over 80% of which are endemic to vents 3. This high rate of endemism is a likely result of the unusual physiological adaptations necessary for survival in such an extreme environment, meaning that these species are highly evolutionary distinct (e.g. chemosynthetic organisms dependent on the sulphur produced) 4. In addition, a very high proportion of species are likely to be extremely rare, often comprising only a few recorded observations of individuals 1. Observations of deep-sea vent ecosystems and their flora and fauna over recent decades have stimulated new theories on the origin and evolution of life on Earth, lending even greater weight to the importance of these extremely spatially-restricted ecosystems 5. Marine protected areas have been established at deep-sea hydrothermal fields, notably in Canadian and Portuguese waters 6, and their representation within protected areas is likely to increase further over coming years 7. The scientific advances that discoveries at hydrothermal vents have allowed have considerable value. 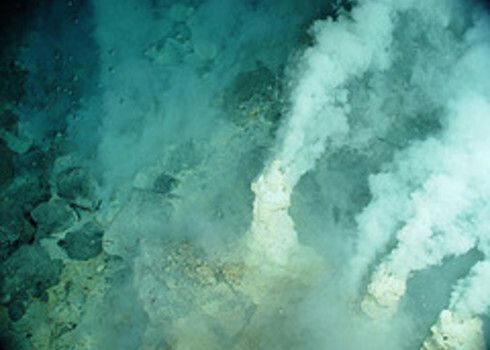 Hydrothermal vents revealed a totally new domain of chemistry on the Earth. Hypothesis on the origin of life on Earth immediately changed because the vent environments provided examples of new types of chemically reactive environments which could mirror what existed at the dawn of time. These systems have also provided insights into the limits of life in extreme conditions, and the upper temperature limit for life is currently thought to be 122°C 8. Hydrothermal vents are an important focus for research because of their unique nature and potential to significantly advance scientific understanding 9. Vent sites are being considered for their potential to support valuable mineral deposits. The activity of the vent results in potentially commercially valuable resources and a number of companies are already showing interest in exploiting these resources through bioprospecting 10, 11. At present, the future usefulness of these potential resources remains to be quantified, but the value of organisms that function in extreme environments has been estimated to be $ 500 million per year for bacteria collected from hot springs, thereby highlighting the possible benefits 9. Hydrothermal vent ecosystems are new to science and have had limited scrutiny because of the difficulty and expense in getting to them. Because the chemosynthetic communities are so new and unstudied, there is a risk that threats such as deep sea fishing could impact on species and habitats before they are known to science 12. Of the potential threats to these habitats, mining is considered to be one that could cause considerable damage. Seafloor Massive Sulphide (SMS) deposits are of great interest because they potentially contain significant quantities of commercially valuable metals such as gold 1. At this stage, there are very few businesses involved in this domain, and the activity is at very early stage exploration. Types of threats include direct damage to the seafloor and vent structure, which could potentially lead to the extinction of species, and production of sediment plumes, which could smother filter-feeding organisms. Impacts, such as noise and alteration of the fluid dynamics, are also a concern. There has been no international assessment of the risk that hydrothermal vent habitats are under. The considerable gaps in knowledge about these areas, because of the difficulty and expense of studying in such an extreme environment, make it currently impossible to quantify the risks. Baker, M. C., Ramirez-Llodra, E. Z., Tyler, P. A. & al., E. Biogeography, ecology, and vulnerability of chemosynthetic ecosystems in the deep sea. in McIntyre, A. (ed.) Life in the World's Oceans: Diversity, Distribution and Abundance. 161–182 (Wiley-Blackwell, 2010). Van Dover, C. L. The ecology of deep-sea hydrothermal vents. (Princeton University Press, 2000). Beatty, J. T. et al. An obligately photosynthetic bacterial anaerobe from a deep-sea hydrothermal vent. Proc. Natl. Acad. Sci. U. S. A. 102, 9306–9310 (2005). Martin, W., Baross, J., Kelley, D. & Russell, M. J. Hydrothermal vents and the origin of life. Nat. Rev. Microbiol. 6, 805–814 (2008). UNEP-WCMC. National and regional networks of Marine Protected Areas: a review of progress. UNEP-WCMC, Cambridge, UK (2008). Van Dover, C. et al. Designating networks of chemosynthetic ecosystem reserves in the deep sea. Mar. Policy 36, 378–381 (2012). Takai, K. et al. Cell proliferation at 122oC and isotopically heavy CH4 production by a hyperthermophilic methanogen under high-pressure cultivation. Proc. Natl. Acad. Sci. U. S. A. 105, 10949–54 (2008). InterRidge. Management of Hydrothermal Vent Sites. Report from the InterRidge Workshop. in Manag. Conserv. Hydrothermal Vent Ecosyst. (eds. Dando, P. & Juniper, S. K.) 29 (InterRidge, 2001). Wedding, L. M. et al. From principles to practice: a spatial approach to systematic conservation planning in the deep sea. Proc. Biol. Sci. 280, 20131684 (2013). McIntyre, A. Life in the World’s Oceans: Diversity, Distribution and Abundance (Wiley-Blackwell, 2010). Baco, A., Rowden, A. & Levin, L. Initial characterization of cold seep faunal communities on the New Zealand Hikurangi margin. Mar. Geol. (2010).